Geek Grotto - Get Your Geek On! 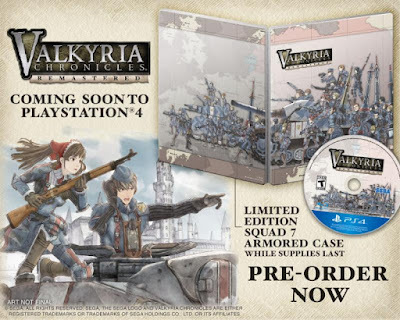 : Valkyria Chronicles Remastered Heads To The US! Valkyria Chronicles Remastered Heads To The US! This spring, prepare to relive the Gallian War in 1080p/60FPS as Sega is bringing the HD remake of Valkyria Chronicles to the US for $29.99! Pre-order and First Run copies get an "Armored Case," which is Gallian for SteelBook! After the break, watch the latest trailer and read Sega's press release! IRVINE, Calif. - JAN. 25, 2016 - Valiant citizens of Gallia, to arms! Bid farewell to your loved ones, because it is time to defend our peaceful nation from the Empire. Valkyria Chronicles, the critically acclaimed PlayStation®3 tactical RPG, will be remastered and released in the Americas and Europe on a brand new battlefront: The PlayStation®4! Valkyria Chronicles Remastered brings the World War II-inspired story, the beloved characters, and the mythology of the Valkyrur to life in 1080p/60fps HD. The game will have both a physical and digital version, and will sell for $29.99/CA$44.99. And as a special bonus, pre-orders and a limited number of launch edition retail copies will come in the collectible Squad 7 Armored Case.